Article policy - What is on topic here? Solarus is an ARPG engine and game authoring tool. Solarus games are called "quests", and can be made with the Solarus Quest Editor. The project also has in-depth tutorials for using the tool. Using Solarus, aspiring game developers can make sophisticated Zelda-like games, and other types of games. Virtually every aspect of the game engine is customisable via the Lua API, and the authoring tool has graphical editing of several aspects, such as map making. The latest version of Solarus is 1.4.5, and was released November 22nd. The Solarus team are currently hard at work with version 1.5, which comes with lots of improvements and bug fixes. For now, you can download version 1.4.5 from the Solarus website. See Solarus for more information about this great engine and authoring tool. Widelands is a real-time strategy game. 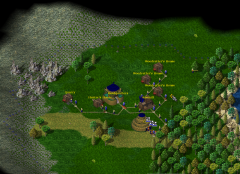 The object of Widelands is to build the economic infrastructure, and manage the construction of roads in order to expand the settlement and go to war. The economic network is big and complex, and varies slightly in the different playable tribes in the game. Widelands was initially heavily inspired by Settlers 2, but has since surpassed it in terms of variety and complexity, whilst remaining rather intuitive. A new version was released Februrary 22nd. It can be downloaded from the Widelands Web site. See Widelands for more information about the game. This page was last edited on 14 October 2014, at 20:48.